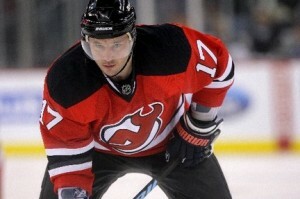 Ilya Valeryevich Kovalchuk (Russian: Илья́ Вале́рьевич Ковальчу́к; born April 15, 1983) is a Russian professional ice hockey left winger who currently plays for the New Jersey Devils of the National Hockey League. 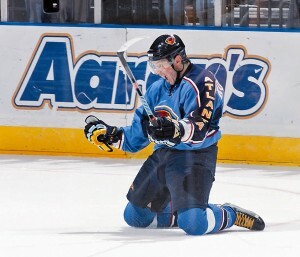 Drafted first overall in the 2001 NHL Entry Draft by the Atlanta Thrashers, he began his NHL career in 2001–02 with Atlanta and was nominated for the Calder Memorial Trophy as league rookie-of-the-year. He is a three-time NHL All-Star and won the Rocket Richard Trophy as the league’s leading goal-scorer in 2004 in a three-way tie with Jarome Iginla and Rick Nash. After eight seasons with the Thrashers, he was traded to the Devils in February 2010 and recently signed a 17-year, $102 million deal with the New Jersey Devils, which was set to expire at the end of the 2026–27 season. The contract, however, was rejected by the NHL on July 21, 2010 due to the league’s opinion that it circumvented the NHL’s Collective Bargaining Agreement. On July 21, 2010, the National Hockey League Player’s Association (NHLPA) filed a grievance on behalf of Kovalchuk to contest the issue of contract rejection, arguing that the contract was, in fact, legal, and did not violate the terms of the Collective Bargaining Agreement. A “system arbitrator” was approved by both the NHL and NHLPA on July 31, 2010. On August 4, 2010, the court case involving this contract went underway and concluded on August 9, 2010 with the arbitrator ultimately ruling in favor of the NHL and voiding the contract, making Kovalchuk a free agent. On September 4, 2010, the league approved a new contract from the Devils that was submitted a few days prior along with a new agreement with the NHLPA. The deal, rated at 15 years and worth $100 million, will see that Kovalchuk remains in New Jersey until the completion of the 2024-25 NHL season. Internationally, Kovalchuk has played for Russia in the IIHF World U18 Championship, World Junior Championship, World Championship, World Cup and Winter Olympics, highlighted by back-to-back gold medals in the 2008 and 2009 World Championship.